Hybrid NAS Array: Ethernet-based hybrid (disk and SSD) arrays which provide access to files using network file sharing protocols such as NFS, SMB/CIFS, or AFP. 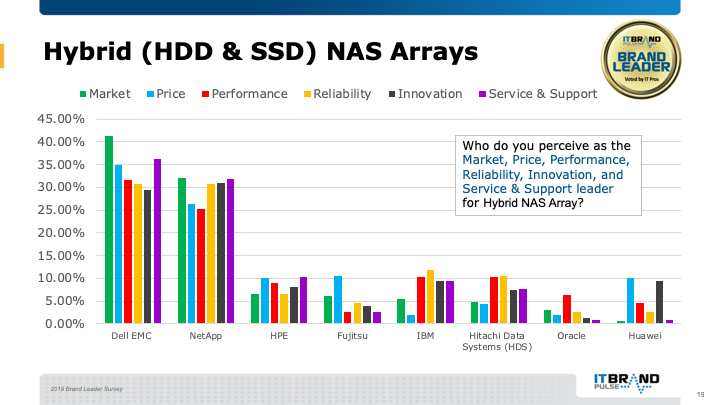 IT Pros voted Dell EMC as Market leader for Hybrid NAS Arrays, dethroning former eight-time leader, NetApp. Dell EMC also gained Price, Performance, and Service & Support. NetApp—second place Market leader—claimed the Innovation leader award as well as tying with Dell EMC for Reliability. HPE rounded out the top three Market leader positions.